If you are currently in the market for a card printer to crank out your employee ID's or loyalty cards, it's worth taking a look at Zebra's new card printer line. Zebra recently introduced three new card printers and Aptika put these new printers through the paces. All in all the ZC Series incorporates all the best features of modern card printing in one box but it also adds some advanced features not seen in your typical card printer. In smaller environments such as retail stores, hotel front desks, or offices, desk space is often at a premium, and equipment ideally should match your space design and branding. Zebra has created the slimmest profiles and lowest clearance in their class, with customizable covers to create a printer that fits easily into your environment while reflecting your brand identity. New in this generation is the ability to remove the side panels to access the interior of the printer. Sometimes in card printing things go wrong and it's nice to have access to the interior of the printer. The ZC100, ZC300 and ZC350 Series card printers feature a new card feeder that automatically adjusts to the thickness of each card. If you need dual-side printing, the models have an optional flipper module that is field upgradeable. Zebra has addressed one of the headaches of card printing with hinged doors on the card output hopper and a new ribbon door design that simplify loading and unloading. 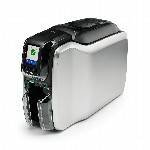 All of this makes Zebra's new card printers faster and easier to load. There's only one way to insert the ribbon, so users will never wonder if they're inserting the ribbon correctly. All these design features add up to a really cool printer. 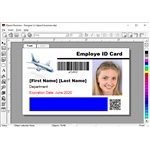 Security is always a critical issue when it comes to card printing—both for cards and the printers that produce them. 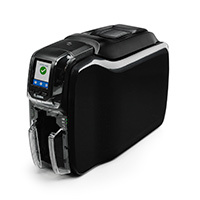 With the ZC100 and ZC300 Series, the dual-sided printer has the option to send finished cards to a secure 10-card bin within the printer for added security. There's also an optional printer cover lock that secures all media, including cards and ribbons. For more advanced security requirements, Zebra incorporates host authentication firewalls to prevent printer intrusion, and its government-grade encryption features help protect sensitive data in the most demanding security environments. Speaking of security, the ZC350 offers smart card encoding such as contact and contactless encoding, as well as your typical magnetic stripe encoding. 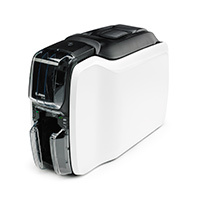 New in these printers is the ability to read proximity and iClass cards. The ZC350 offers three new ribbon choices featuring specialty colors and special effects, such as color-shifting graphics that are hard to counterfeit and watermarks that can only be seen when the card is tilted at an angle or viewed under UV light. On the downside, the printer must be connected to your PC to access the driver. This can be a pain if you are trying to do remote maintenance or demo the driver. If your printer is not connected, the driver won't load. That's our only complaint. All in all a great series of printers. We're impressed! Visit Aptika now to request additional product information or call us at 1-800-943-2341 to find out if one of these devices is right for you.